This PDF 1.5 document has been generated by Acrobat PDFMaker 11 for Word / Adobe PDF Library 11.0, and has been sent on pdf-archive.com on 28/08/2016 at 03:32, from IP address 69.138.x.x. The current document download page has been viewed 213 times. File size: 265 KB (8 pages). Qcs Qorqc vdhh sjphfus xkr. 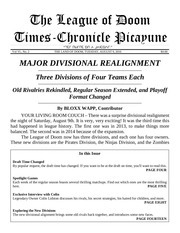 A survey of newly enacted rules changes and their explanations. 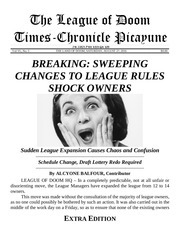 A transcript of an important press release issued by the League Managers regarding trades. An investigation into the origins of the newest members of the League of Doom. presumably done in order to avoid bothering them. difficulties by the end of the season. on the afternoon of the draft itself. person league? Whoever heard of such a thing? Twelve is the standard, 12 is the line. of Doom rules have been changed. a bench size of five. 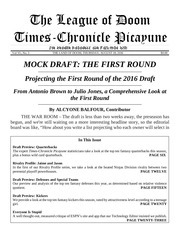 places a greater emphasis on good drafting at the beginning of the season. receivers, three tight ends, two team defenses, and two kickers. quarterbacks, five running backs, six wide receivers, and four tight ends. down 30% from the previous maximum of 60 running backs. to better reflect the impact that defenses have on whether or not a team wins. returns, and blocked kicks of any type will be worth two fantasy points, and onepoint safeties will be worth one point. the various statistics in question, like sacks, interceptions, and so on. had only weak correlation coefficients, at best. offense. The remaining low-correlation statistics were eliminated. it a very strong correlation that is highly statistically significant. been 14.59 points in 2015.
of the counteroffers, which will immediately be binding. League Managers remind you that all of this is as it has always been. Pictured: the new owners. From left to right: Emily Greene, Bobby Marshall. THE DEEP WEB – The surprise league expansion raises many questions. League Managers’ preferred owners win? league in the first place. if the Managers made this unprecedented offer in person or through an intermediary. Is this individual in collusion with the Managers? Unfortunately, it is not clear which new owner is which. What little information that is known about the new owners is offered below. she may wear a violet pressurized environmental suit. in order for Will, in light of the fact that his brother appears to be deceased. 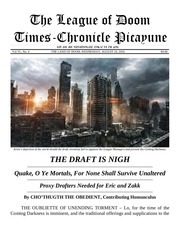 encouraged to contact the Times-Chronicle Picayune. activities in the service of the League Managers are wholly unfounded. This file has been shared by a user of PDF Archive. Document ID: 00456355.